I'm so glad I'm a grown up and like asparagus now. I've been experimenting with different ways to prepare this healthy spring veggie. You can check out my other asparagus recipes like grilled asparagus or creamy orzo and asparagus. I'm still not sure which preparation is my favorite, but I definitely like the flavor produced by roasting. This time I kept the stalks whole, but I've also sliced them into 1-inch lengths to make them bite-size. Preheat oven to 425 degrees. Trim off woody ends of asparagus stalks and slice into bite-size pieces, if desired. Place asparagus in a rimmed baking sheet and lightly drizzle with olive oil; toss to coat. Sprinkle with salt and pepper. 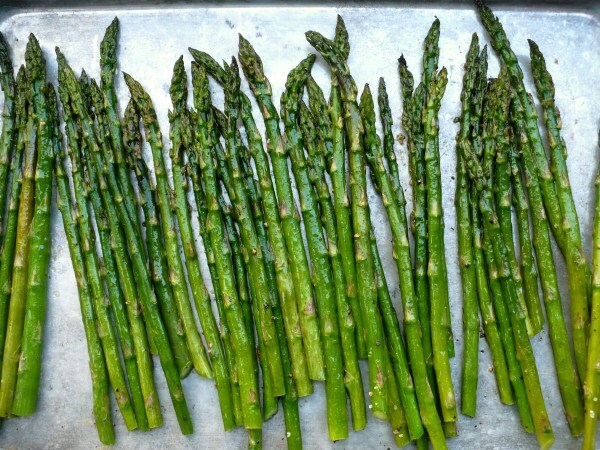 Roast for 7-10 minutes or until asparagus is tender (may take a little longer if stalks are thick).